Regular readers know that I don’t always encourage folks to download updates immediately after they’re released. For instance, tomorrow Microsoft will be releasing a new update that fixes a number of issues. Included are 7 critical fixes and 5 important fixes. I usually recommend waiting 7–10 days just to make sure there aren’t unique problems caused by these updates. I do have an exception this week. Adobe has released a fix for their popular Adobe Reader which is used to render PDF files. In the past, Adobe Reader was a program you’d download as needed but PDF files are now so popular it’s extremely likely the Adobe Reader has already been installed on your system. In the grand tradition of companies trying to shove their other products down our throat you’ll see a pre-checked box encouraging you to download the 50 MB Photoshop Album Starter Edition. 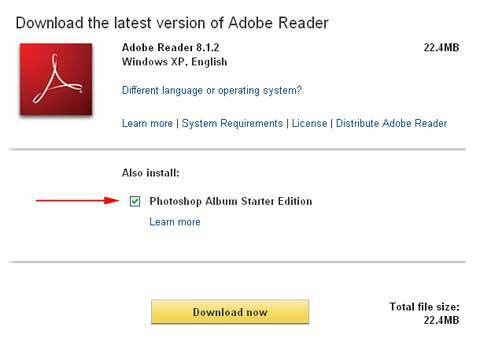 While this may not be a bad package, I recommend you uncheck the box and concentrate on just updating that Adobe Reader. That way if you do have some kind of problem you’ll know which application introduced the change. I would suggest people use free Foxit reader I havent used Adobe Reader in years. I'd agree with Ben's suggestion that Foxit PDF reader is a compact, fast, free alternative to the slow and ridiculously bloated Adobe product. I just downloaded and installed Foxit reader 2.0 after deleting my Adobe Reader program. Donload size only a little over 2 mb. ALL of the Adobe PDF files read quickly and normally with this reader. Any comments on any security concerns? I also run Win Patrol Pro and ESET NOD32 AV as well. I was using firefox and it offered the PhotoShop Album Starter Edition but it was only 8mb. Then I went to it on Internet Explorer and instead it offered google toolbar. Another vote for Foxit PDF reader.